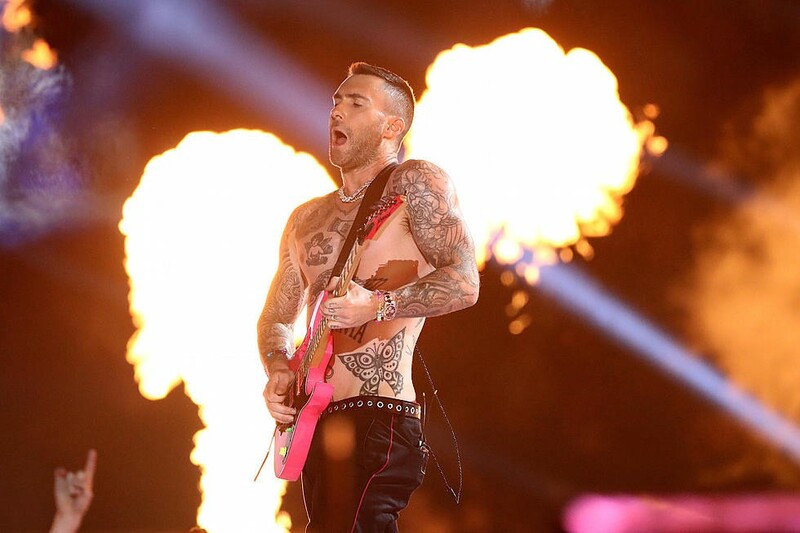 From the moment they were announced as the Super Bowl halftime performers, it seemed like Maroon 5 had nothing to win and everything to lose. What’s the payoff when you’re a band who’s basically embedded in the DNA of radio music? I can’t imagine it was for the check or the publicity. Was it an attempt to regain lost cred after they transitioned to mainstream pop, after frontman Adam Levine took on a corny Proactiv deal and cornier judge position on The Voice? Did they hope it would launch them into a new echelon of ubiquity? Did they think they would, at the very least, have fun? Maybe — but by the time Levine was fully shirtless and dutifully gyrating on screen, it was clear that nobody was having fun. Guest features Travis Scott and Big Boi fulfilled their roles of briefly lending the night some cool. Scott actually provided a moment of relief when he literally exploded onto the stage, delivering the start of “Sicko Mode” alone and engulfed in fire. His energy, contrasted with the glossy set-up that insulated Maroon 5, felt electrifyingly sincere. It wasn’t that Maroon 5 fell flat because they were unaware of what the people wanted; they fell flat because, in the formulaic pursuit of giving the people what they want, they lost any semblance of authenticity. After Cardi B and Rihanna both allegedly turned down the slot in response to the NFL’s treatment of Kaepernick, and after so many people called for a boycott of the event, it’s unsurprising that Maroon 5 would get on stage and deliver a performance divorced from racial and political reality. From the mostly-black gospel choir brought up during “Girl Like You” to the heavy-handed “ONE LOVE” that the lanterns spelled out in the sky, superficial unity and sickly feel-good uplift pervaded the show. Here’s where I have to reveal a bias: I’ve watched Prince’s 2007 Super Bowl performance countless times, and I’m convinced it’s the best there’s ever been. But this also means that, when Levine shouted, “Can I play guitar for you right now?” I was acutely aware of how Prince said nearly verbatim the same thing in his climactic final song. Maybe I’m paranoid — maybe it’s just the polite way to start a guitar solo. Yet I can’t help but think that this was a concerted effort to walk in the footsteps of bona fide legends, and a failed one at that. Perhaps this is what made the performance so distinctly hollow — not the fact that Maroon 5 is a bunch of indifferent corporate rockstars, but that for 13 minutes, this bunch of indifferent corporate rockstars went through the motions of trying to prove so hard that they’re more than that. Super Bowl LIII Halftime Show was originally published in The Yale Herald on Medium, where people are continuing the conversation by highlighting and responding to this story.